Unexpectedly, not only did we manage to bar b q, we also managed to eat lunch outside on Christmas eve and Christmas day – to be fair it was a little breezy on Christmas day, but it was worth wrapping up to enjoy a little bit of sunshine with beautiful views out onto the bay. 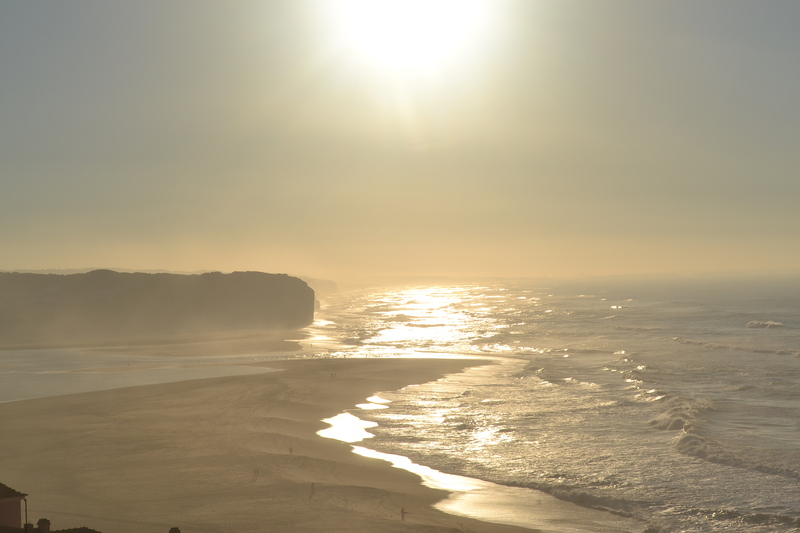 Which turned into the following as the sun started to go down…. We had a lovely tranquil three days in Sao Martinho do Porto and although the campsite itself was ‘average’, it suited the task perfectly. The town itself was very quiet except a handful of people walking along the seafront until Christmas day in the afternoon when half of Lisbon descended upon it, filling the promenade and coffee shops both inside and out. We can only assume that they came from Lisbon as it is about 100km away and by the following morning they had all disappeared…. Very strange. 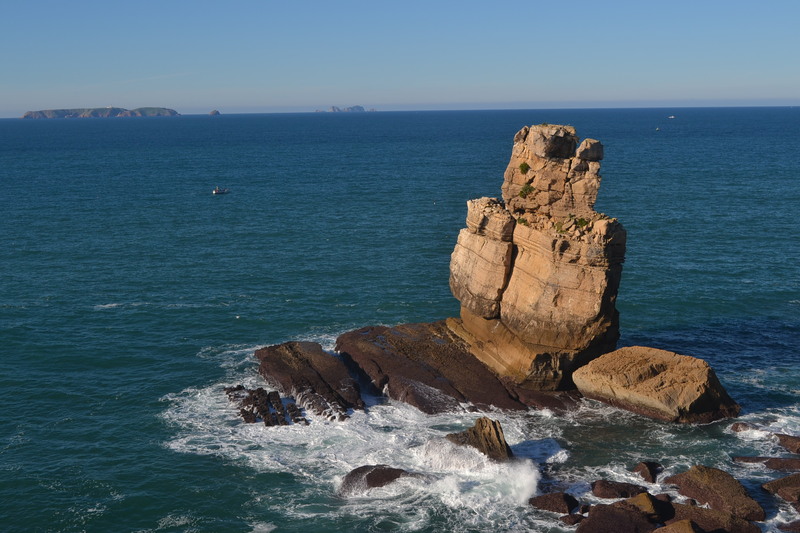 On Friday morning we woke to blue skies and sunshine (if not a little on the chilly side), but as there was the looming possibility of rain at the weekend we decided to head to Peniche to have a look at the Cabo Cavoeiro (point) and the lighthouse where the views looked out over the Berlengas Islands. It was fairly windy, so instead of staying on the Cabo which is 4.5km outside town, we stayed in a Car Park just outside the walled city, opposite the fire station where by the evening 17+ other motorhomes had also decided to park…. you can tell it is the holiday period! As we hadn’t had time to look around the town when we arrived, we headed in for a quick wander in the morning and came across a fantastic food market brimming with local produce as well as fish, breads and dried fruits and nuts. 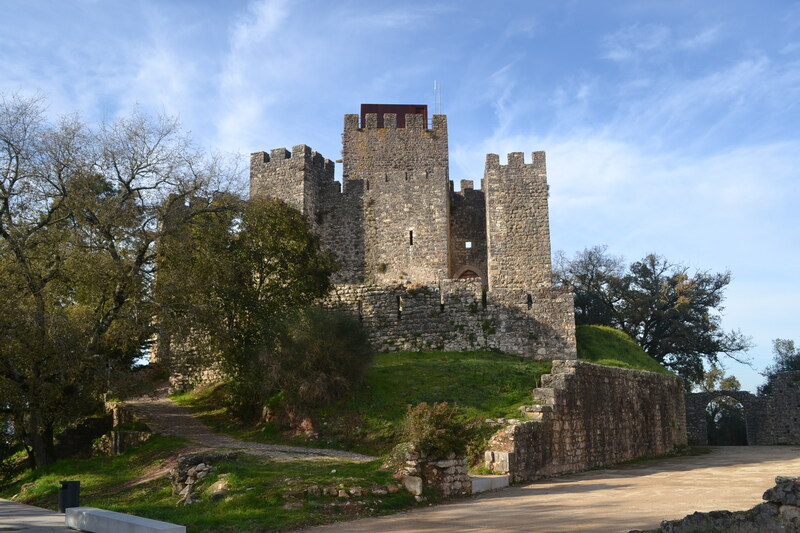 Leaving Peniche, we moved on to Obidos which is a Medieval walled with Roman origins on top of a hill. The town itself is beautiful, with cobbled roads twisting up and down to fit around houses and the castle itself – unfortunately at this time of year (not helped by the addition of the ‘Christmas fayre’) the ‘chocolate box’ town comes with hundreds of tourists and was rammed, which selfishly let it down. 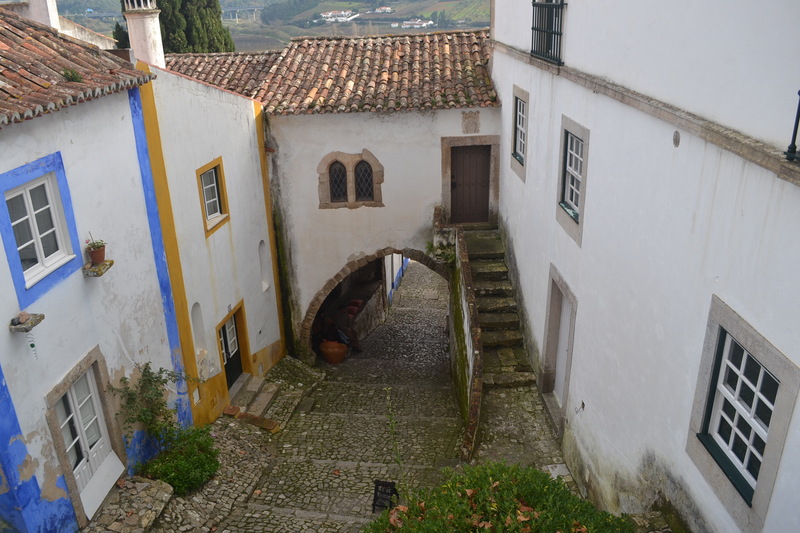 However, it does get extra bonus points as it is the home to ‘Ginja’, which is a cherry liquor and to ‘Pao con Chrorizo’, which is pizza dough stuffed with chorizo and cooked in a hot pizza oven….. I guess you can allow a couple of extra tourists 🙂 – all in all, I would definitely say worth a trip to see and they do have an aire for motorhomes – so parking was easy despite the huge number of cars. 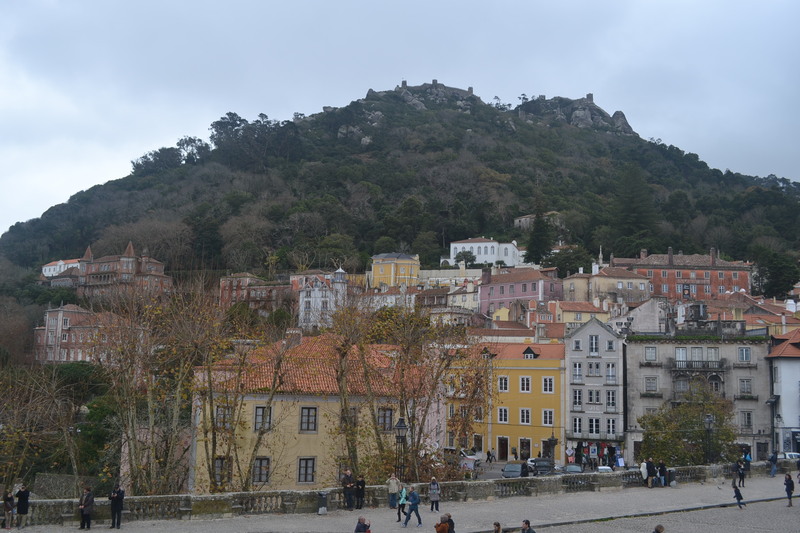 Unfortunately as we were walking from Palace to Palace the clouds came in and just as we started the climb up to the Mouros Castle and Palacio de Pena which were at the top of the biggest hill – it disappeared….so we couldn’t see anything 😦 – we will just have to come back another time. A beautiful place and well worth a visit – just try and steer clear of eating/drinking in the old town as the prices are extortionate …. We did find a lovely café / patisserie close to the Aire though – ‘Casa do Preto’ Estrada de chao de Meninos, Sao Pedro. Whilst in the market we were ‘persuaded’ to buy a rather large whole Sea Bream by a rather over zealous lady fishmonger with not very many teeth (not sure that is relevant, but I am not convinced you could call her a fishmonger either, although to be fair to her she did have a proper stall). She managed to filet most of the fish for us (a few bones add flavour apparently) and before we parted ways, proceeded to give us both two kisses on the cheeks whilst trying to throw some free sardines in the bag to wish us well over the festive period. 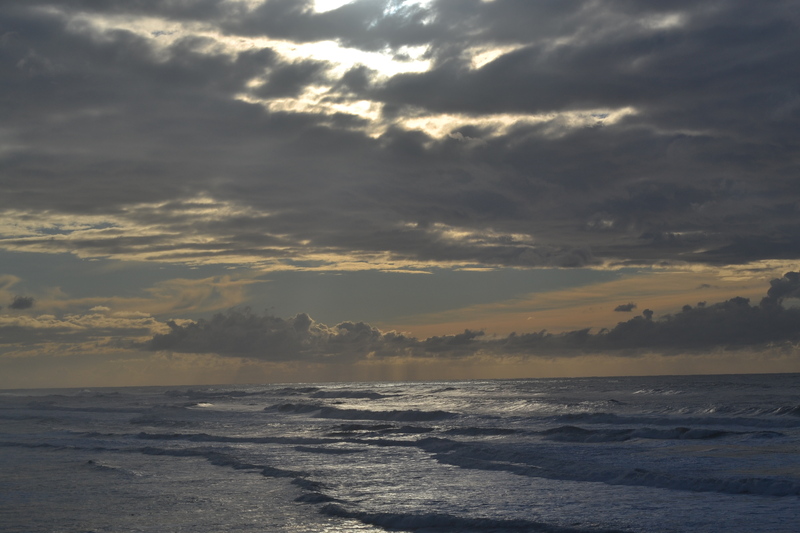 Having found a ‘potential’ campsite for Christmas 20 meters from the beach, we packed up the motorhome and headed south to Foz do Arelho which is set between the sea and a lake, where the sea feeds the lake at high tide. The wind was blowing a hooley again and there were lots of kite surfers taking advantage of the weather – the first we have seen since we arrived in Portugal. The Aire was privately owned (3 euros a night), set about 500m down the side of the lake rather than on the sea front so we were a little more protected from the wind. It was a big gravelly car park with good facilities and stunning views. Another idyllic location, but they said that we couldn’t have a bar b q – so that helped make the decision to go back to Sao Martinho do Porto for Christmas, but meanwhile we decided to spend three nights here. On Sunday we headed to a restaurant ‘O Tavola’ to try some of the local cuisine. For starters we tried some Morcilla (Black Pudding) with pickled cauliflower and some local cheese – both of which were delicious. For main we shared a local speciality which was a pork and seafood stew cooked in a metal wok like contraption with a lid connected to the bottom part. The sauce was rich and full of flavour, one of the best that we have had in a long time. To help burn off the calories we had eaten the day before we decided to venture out on the bikes all the way round to the other side of the lake to a village called ‘Bom Suceso’. Looking out the window from the motorhome, I would say the village was about ½ km across the lake….. 22.5km (and rather a lot of hills) later we arrived, had a coffee, ate our sandwiches and opted for the slightly less hilly route (although equally as far) on the way home. It was very pretty, but as we haven’t been out on the bikes for a while there are a few aches and pains today. For those of you who celebrate it, have a fantastic Christmas. Having jumped through a 100+ miles of Portugal to find the LPG adapter we missed the Douro river and some of the beautiful coastal villages, but we have decided that instead of heading back to cover the ground this time, we will come back when the weather is a little warmer and we can visit some of the national parks in the mountains as well…. Portugal seems to have lots to offer! 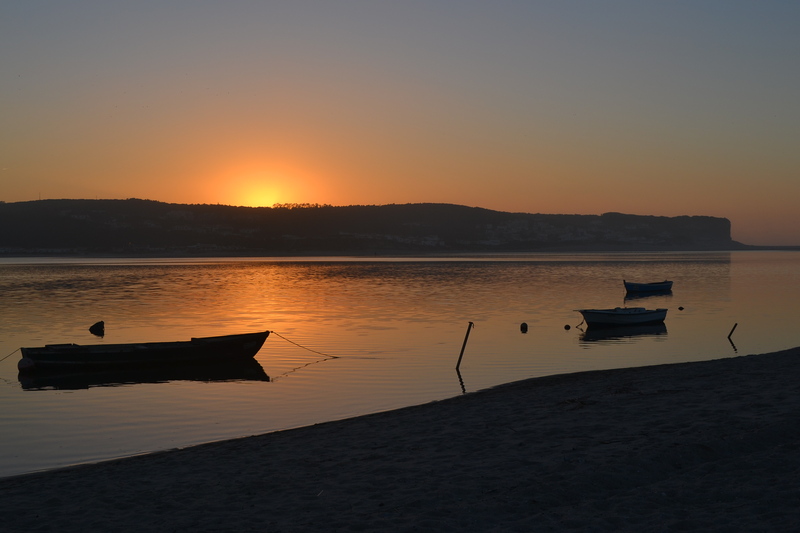 So, from Coimbra we headed to the coast again stopping in Figuera do Foz which, like many coastal towns, had lots of sea front, but not much in the actual town. The walk along the front from one end to the other was about 7kms and despite being a Saturday afternoon it was actually fairly quiet. After taking advantage of the long promenade for a morning run (although, massaging the aching calf muscles afterwards due to the uneven cobbled surface I am not sure I took any advantage at all), we enjoyed a local version of our cooked breakfast using the last can of heinz baked beans (we did bring quite a few with us), morcilla (rice based black pudding with spices), chorizo, eggs and homemade bread – more of a brunch than breakfast, but all the same, delicious. 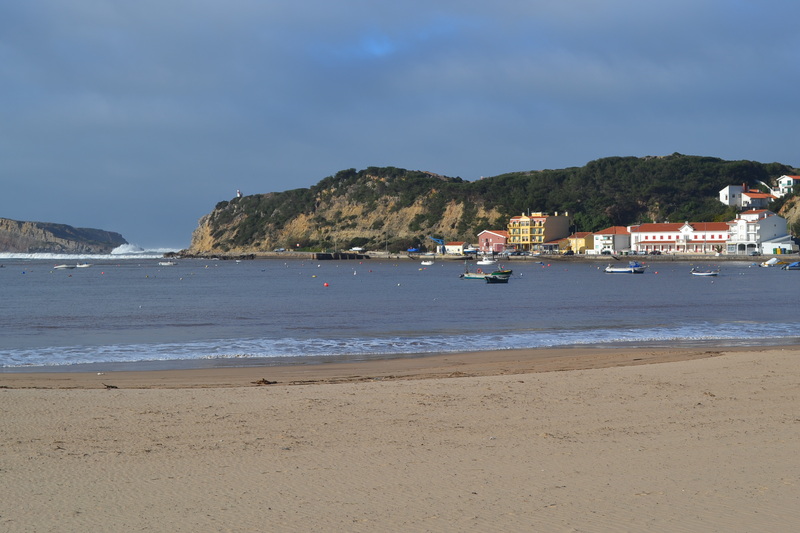 Needing a bit of a walk to let the food go down we headed out along the seafront again before moving all of 14km down the coast to a village called Costa de Lavos where we parked in an Aire pretty much on the beach where we could watch the waves roll in. Not needing lunch, but still a bit peckish come mid-afternoon, we set off to look for a café/patisserie. The village was too small and despite finding a couple of Cafes, the quality of the cakes was well below par. There was however a little old lady with a stall on the street corner selling some fruit and veg, nuts and what looked like biscuits and rock cakes. We bought a rock cake and a biscuit to share, both were delicious – I think the rock cake even had carrot in it, however nearing the end of it I was lucky enough to find a bit of ‘extra’ flavour … she had left a large chunk of walnut shell 😦 Thankfully no damage caused – I am sure it is a bit like cooking meat on the bones and added to the taste! We had seen a pear like fruit/vegetable growing on trees whilst walking a few days ago and not knowing what it was looked for one at the market. We think it was a ‘Xuxo’ (Chayoti), which looks like a Pear with slightly more wrinkled skin. When we asked the lady in the market what we should do with it she (well, more her husband, although I am sure that he had never cooked one in his life) said ‘sopa’ … so we took the plunge and thought we would add it to the pasta and vegetables we were cooking in the evening. It was ok and bulked out the vegetables, but despite its ‘qualities’ it won’t be forming part of our 5 a day – unfortunately it has absolutely no flavour. Apparently you cook it in soup or similar to soak up the flavours of the other vegetables…. next time maybe. Leaving the trains behind us we drove on to Fatima. 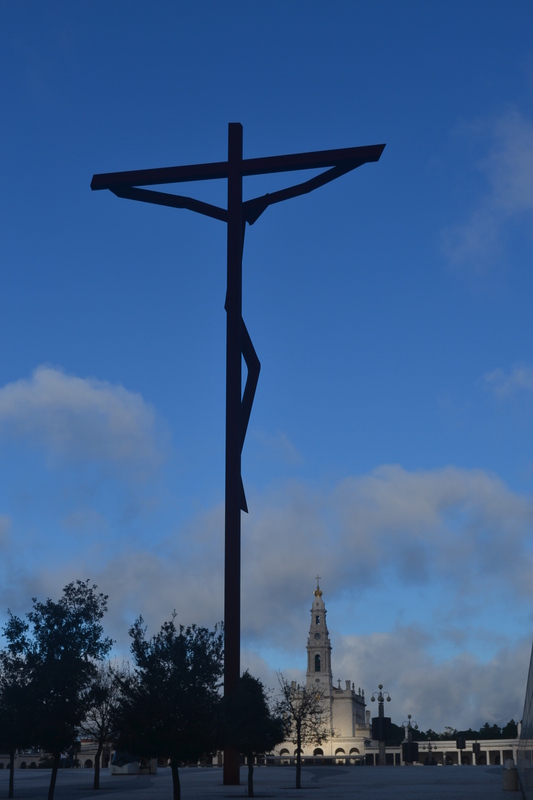 Not wanting to offend anyone, the easiest way of describing Fatima is to liken it to Wembley Stadium (with better parking) with a very large church at each end and several chapels around the outsides. It is a sacred place due to apparitions – the most recent of which occurred in 1917 when 70,000 people witnessed an apparition of ‘the miracle of the sun’. There must be thousands of people who visit each year on Pilgrimage as the place is huge and the surrounding town is hotel after hotel after souvenir shop. Not being religious, both Keith and I found it a little odd, but impressive at the same time. 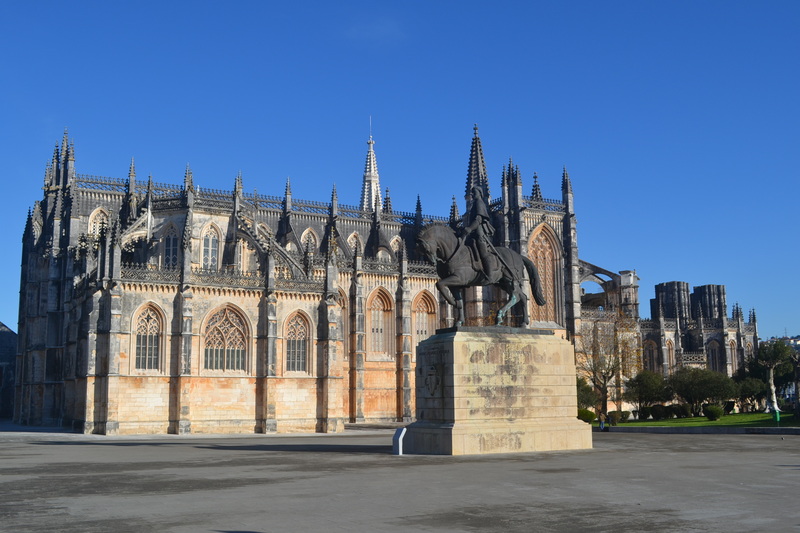 Sticking to the religious theme we moved on to Batalha which is the home of the Monastery of Santa Maria da Vitoria, constructed to celebrate Portuguese independence following the Battle of Aljubarrota in 1385. Obviously, we like to support the local economy wherever we go and tried the patisserie, bought some of the local plonk, and spent the day today exploring the pine and eucalyptus forests on a lovely 23km walk …. It was supposed to be 19km but the signage was a bit poor and we got lost a couple of times …..very nice and tranquil though..
We left the campsite and headed to the motorhome place we had found on line which was roughly 15km away… although it felt much further as the roads were all original old style cobbles which meant everything rattled …. I am sure my ears continued to ring until the evening. The chap was very helpful, but didn’t have the required adapter. He phoned around and pointed us towards a LPG workshop just up the road who thought that they would be able to help….. when we arrived however, they looked at our gas adapter like it was alien – unable to help us. After a couple of calls back to the UK to find out how much it would cost / how long it would take to get the adapter sent out to us, we agreed to continue our quest to find a gas adapter despite wanting to head up the Douro to visit more Port houses. We headed towards Burstners’ main dealership in Portugal to see if they could help us, stopping at another dealer on route. Unfortunately, neither place had the required adapter but both pointed us to another LPG workshop/garage about 15k from Coimbra who did have an adapter, but only the one they used at the filling station and they didn’t really want to part with it. However, whilst Keith was talking to the garage owner, a gentleman was filling up his Portuguese motorhome with LPG and upon overhearing the conversation said that he had an adapter (why, we will never know, as his motorhome had a different internal fitting), and that we could have it for 20 euros. Despite thinking that he was probably trying it on a little bit with the price, Keith decided that it was much less than we would have to pay to get an adapter sent out to us – not to mention the time bearing in mind it is nearing Christmas. So, one dodgy deal later and we now have a LPG gas adapter (and filled up with LPG!). I appreciate LPG adapters and washing the roof of a motorhome is a bit dull for the rest of you, but when you are away the lack of availability of small, but important things that are so easily available in the UK can have a big impact on day to day life and can quickly become all consuming. As it was late in the day when we left the motorhome workshop we headed to a place called Condeixa do nova which is 20km outside Coimbra. The Aire was just near the market on the edge of town approximately 2kms from one of the largest Roman settlements in Portugal – Conimbriga. In the morning we walked out to the ruins and on a circuit which took us through some of the other nearby Roman villages, before heading back to the motorhome and moving on to Coimbra. We were surprised to see lots of motorhomes parked in the Aire when we arrived, but despite the sign stating you could only stay for 24 hours, it appears that they were all fairly long term residents but everything was clean and tidy and quiet. Following our recky we returned to the back streets in the old town to a little restaurant / Café where the queue was out the door – their speciality being suckling pig. Running low on gas …. 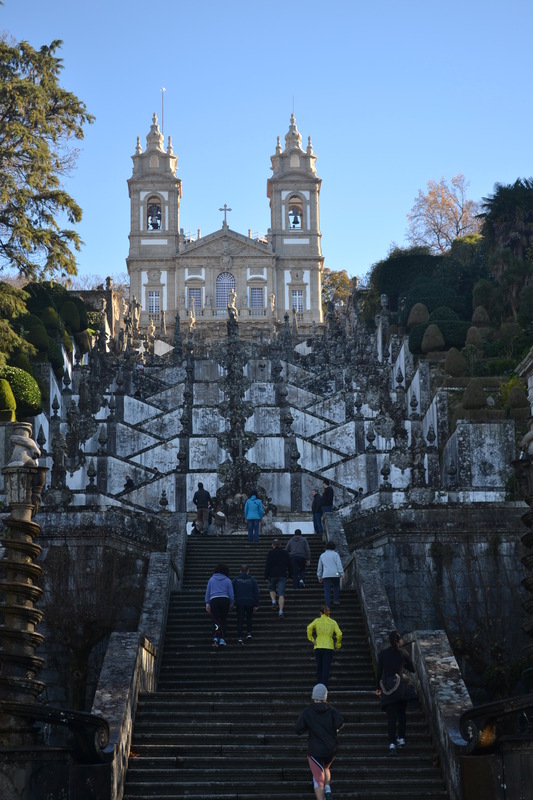 After a cold night and a frosty start we decided that heading further into the mountains wasn’t a great idea and that we were better to stay in lower grounds, so we headed back to Viano do Castello for the night before heading on to Braga and Bom Jesus. 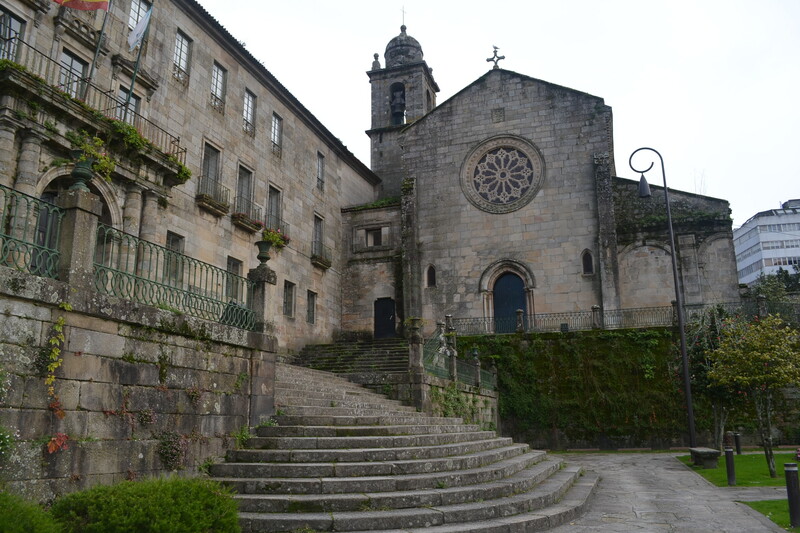 Bom Jesus is a religious sanctuary positioned at the top of a hill just outside Braga….. to be precise (450m up and about 2.5km out) It was listed as one of the places we could park the motorhome overnight, so we parked up (roughly 100m below Bom Jesus itself), had lunch and walked down into the old town to have a look around. Braga has a beautiful old town which I am sure seemed even nicer with the blue skies and Christmas buzz, but it is a large town which comes with the cars and traffic, so it was actually quite nice to be parked up slightly away from the noise. The walk up to the sanctuary was a popular one, probably helped by the fact that it was a Sunday and we were positioned between two religious holidays, so as it coincided with a day when Keith was going for a run as well, we both had a morning run down the hill and then back up again – hard work! After breakfast we ventured up to the Sanctuary to admire the views over the city. With the cold weather we have been using the heating a little more than we had planned which in turn has meant that we have been sucking LPG more quickly. We had tried a couple of fuel stations en route to Braga, but none had the correct connector for us to fill up, so headed to try out a few more fuel stations with the hope that one would be able to help us. Several fuel stations later and we now realise that we should have bought the eurodish adaptor before we came away, we have been lucky as all the fuel stations in France and Spain have had the necessary adapters. Lesson learnt and as we still have one tank full, we decided that we would be better to head towards Porto to see if we can find a motorhome accessories place to buy one before we run out….. roll on Tuesday and we will see how we get on. After a meander through the twisty streets and a stop for coffee and cake we headed for a campsite (Parque de Campismo Sol de Vila Cha, 14 euros all inc) – the first in a long time – just north or Porto where we plugged into electricity and had a haircut before catching the metro and heading into Porto on Monday for a look around. 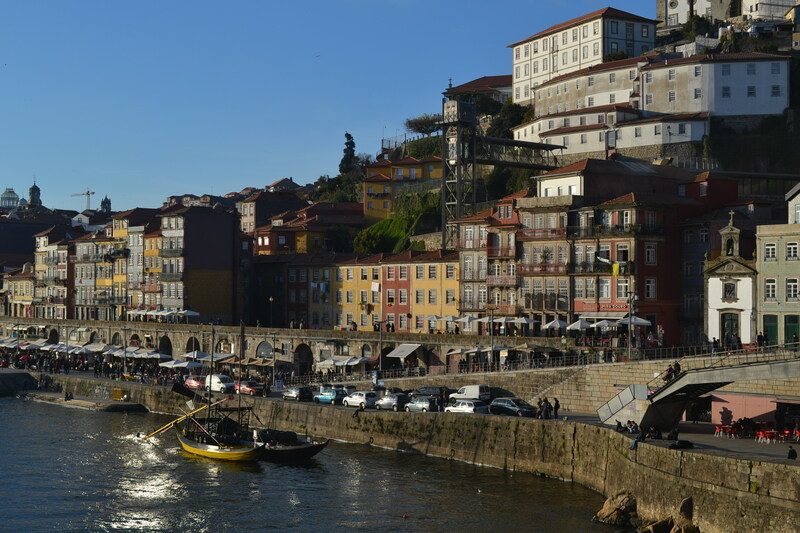 Porto is a ‘rustic’ city, which unlike some of the other large cities we have visited as we have travelled through France and Spain, isn’t quite as refined and doesn’t have the clean edges. The streets are narrow and the houses lean towards each other in a way that makes you think that at some point in the future they will end up supporting each other at the top. Every house is different, not just in the colour of paint, but also its style, number of floors, width …. as though they have been built at different times – but this is just the style. 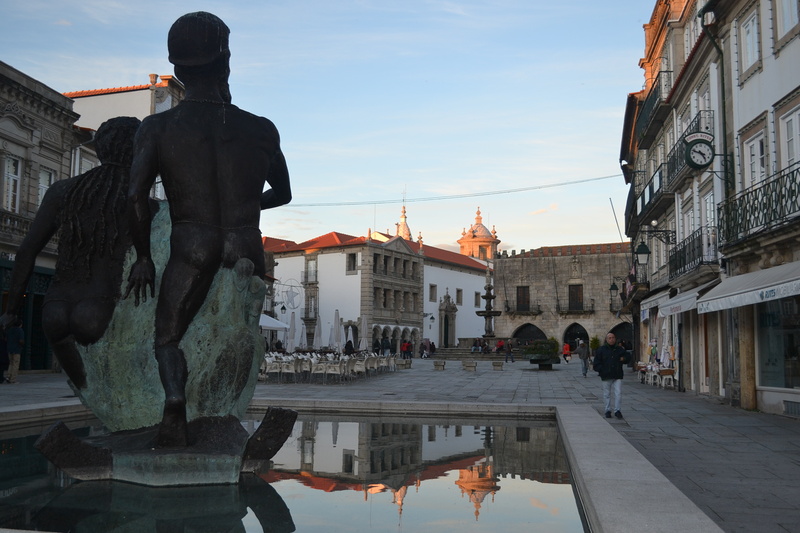 The prime examples being on the river Douro in the center of town. Being unable to visit Porto without trying some Port we popped over the bridge to the Port houses and invested some time in learning about the different Ports produced by Ferreira, Calem and Kopke. We left Porto on the metro slightly wiser and slightly worse for wear … despite having been given chocolate to go with our Port at Kopke which was new to us…. We left the vineyard and headed to A Guarda as recommended by the very friendly lady who talked us through the wines the previous evening. 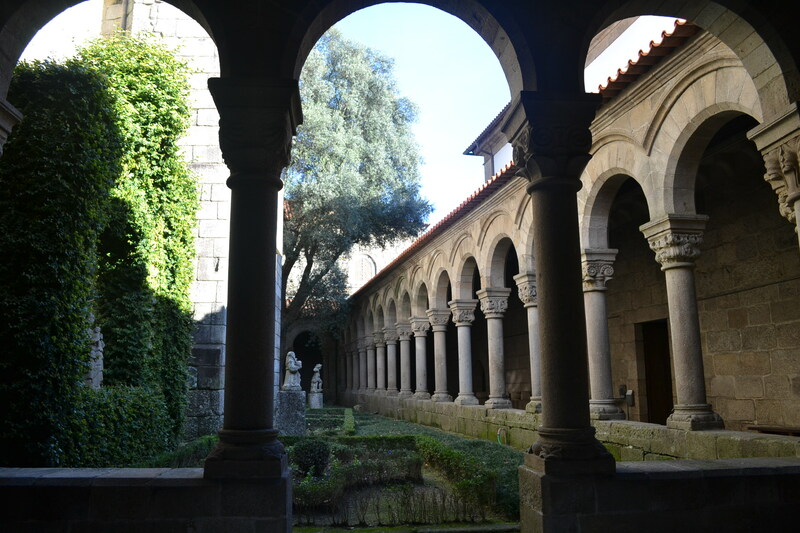 She told us that while we were in the area, it was definitely worth a visit to see the Celtic settlements and the views along the river and out into Portugal. As we were less than 10 kms away and not in a rush, we thought it was worth a visit. 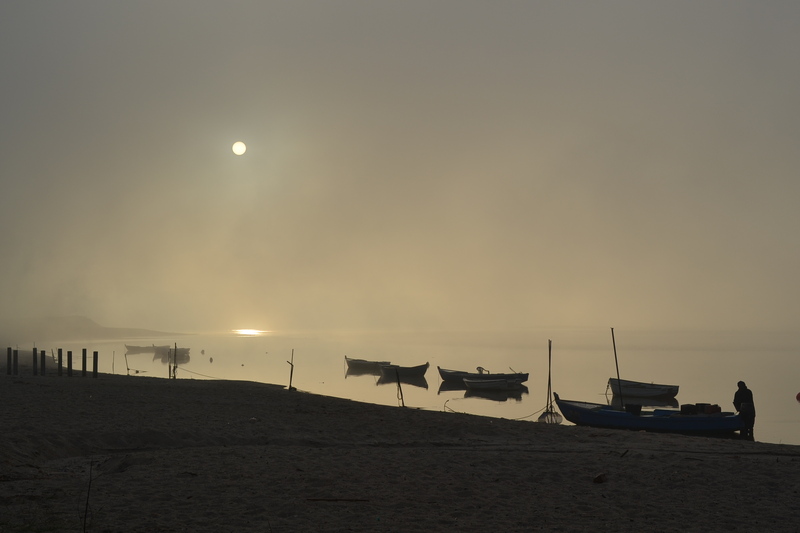 Unfortunately it was a slightly misty day – but the views were still spectacular. Having not had time last night to bake any rolls for lunch, we took the opportunity to wander around the town to find a bakery before heading over into Portugal to pastures anew. First stop was a little town called Vila Praia de Ancora where we parked in a small car park on the sea front with three other motorhomes – the most we have seen in a long while. 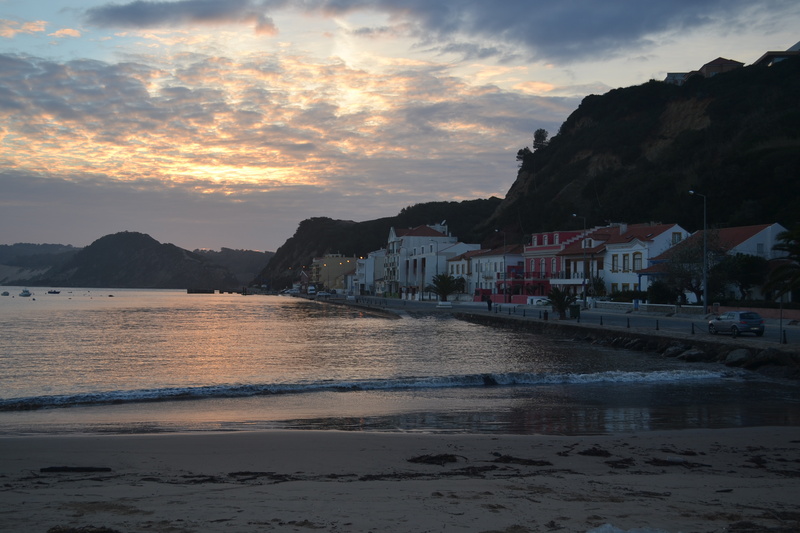 We went for a lovely walk along the seafront as the sun went down and stopped at a little local bar for a glass of wine to toast to our arrival into Portugal – costing us all of 1 euro 20 for the two very generous glasses. I went for a lovely run in the morning along the seafront going against the gale force wind on the way and travelling with it on the way back …. Just how it should be – just unfortunate that I had to do it twice to get the mileage in! Next stop was Viana do Castelo, all of 15kms down the coast. 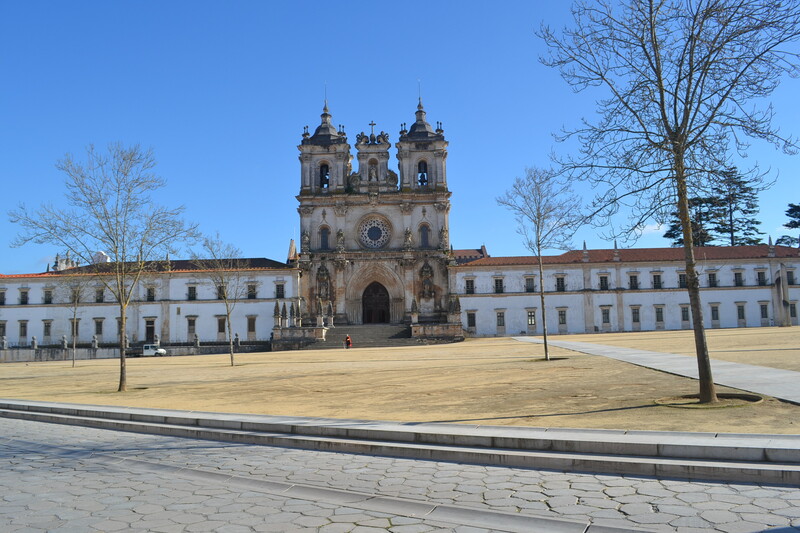 This is the first reasonably sized town in Portugal and we were trying to hunt down a Vodafone shop to get a Portuguese Sim card for our router – so figured it was worth stopping for a look around. 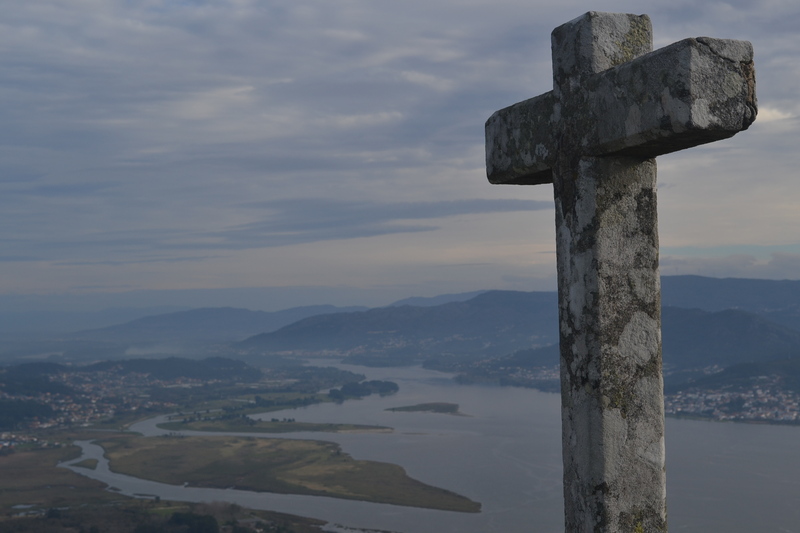 Viana do Castelo is a really pretty little town with boutique type shops, a small shopping centre and a fishing port. Christmas is officially here though, as they had red carpet rolled out down the streets, decorations on the side of all the buildings and Christmas carols blaring out of the loudspeakers around town. Feeling obliged to get into the spirit, we stopped for a coffee/wine and cake with the obligatory seasons addition of Cinnamon and spices ….. Bollo com mel (Cakey biscuit with chocolate, cinnamon, spice and honey) and Jesusitis (?) (Filo pastry triangle with cinnamon and a very light icing) – both of which were delicious and not too sweet. Our lodgings for the night were facing onto the estuary in a large sandy car-park with three other motorhomes. I can see a trend starting as we were a couple of hundred yards from a bridge going over the estuary which carried vehicles and also trains ….. thankfully they were much quieter. We have been debating whether we should head to the Parque Nacional Peneda Geres, as it is supposed to beautiful, but also fairly high and snow has been falling at around 1000m. Although we don’t have a problem with the cold, it feels a bit unnecessary to go up into the mountains if it is snowing and frosty when we have so much to explore … and we can always come back. That said however, we decided to head inland towards the mountains to see if we could do some low walking from a place called Arcos do Valdevez. We parked up in a tranquil car-park next to the river with the sun shining and a beautiful mountainous backdrop to eat our lunch. We then headed off to have a look around and find out whether there was any walking/cycling locally and were unpleasantly surprised by the lack of knowledge at the tourist office, who pointed us further into the mountains informing us that there wasn’t any local walking here. With a bit more of a push, she said that there was a path along the river that left from the skate board park and possibly went 4 or 5 kms, but that it was more than likely very muddy following the recent rains. Needless to say, we headed along the river bank, which turned more into the river bed than a path – but strangely, it was signposted as an official walk running approximately 9.5km in the direction we were walking, and another 13.5km the other way – how the tourist office didn’t know, I have no idea … it was pretty hard under foot, but very pretty. Needless to say that the only knock on the door that we got whilst in Fisterra was from a little old lady asking us if we wanted to buy some fish 🙂 Unable to use the bar-b-q or having any external washing facilities on the ‘Aires’, I politely declined as it is bad enough having to deal with the smell of cooking a tuna or swordfish steak in the motorhome, let along filleting and cooking a whole hake – as lovely as the idea was. In the morning we took advantage of the fact the sun was still shining, heading for a walk around the bay which was incredibly tranquil. We then set off along a coastal road stopping for a walk and lunch in Muros which is a pretty fishing village, and then on to Boiro where we had planned to stop for the night (or possibly two). 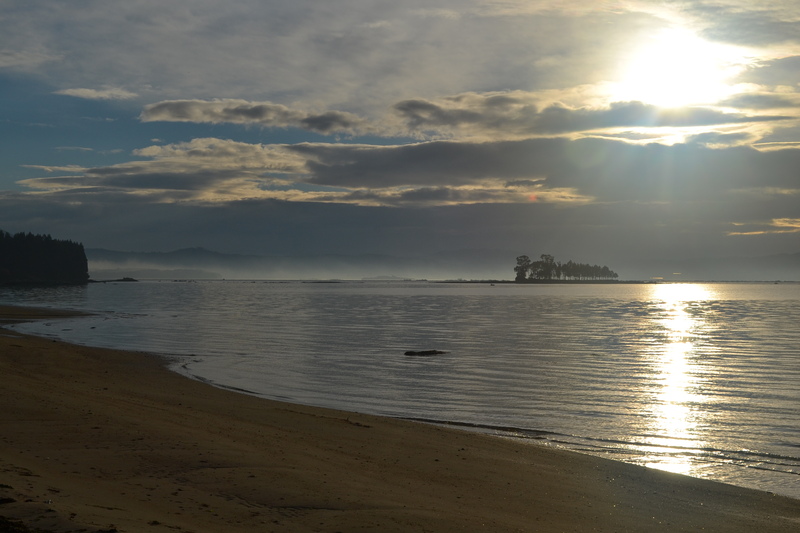 There are two ‘Aires’ in Boiro, one is right on the seafront in the town which despite the reviews looked really nice, and the other is 4km from the center of the town on a beach and felt like it was in the middle of nowhere. We decided to opt for the more remote option where the actual ‘Aire’ was pretty overgrown and the road leading up to it a dirt track, 50 meters down the road however was the beach, where we parked up nose almost touching the sand, roughly 5 meters away from the gently lapping water. Idyllic….. 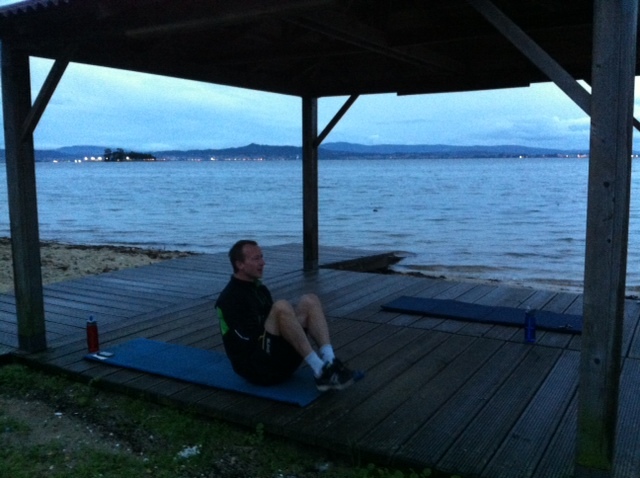 It rained heavily all Thursday night and after a brief pause first thing on Friday morning (when we managed to do our tabata exercises on our rather idyllic ‘private’ beach)… it continued on and off throughout the morning. As I left the motorhome a little dog jumped up to say hello and as I am a softy when it comes to dogs and it was wearing a collar, I gave it a little stroke before looking round to see where its owner was … and couldn’t see anyone. Two hours and 7kms later the little black dog was still following (or better said ‘leading’) us. As much as we tried to get rid of it, worried that it would not know its way home the further we walked, it had decided that we were its new owners leading the way and looking over its shoulder at every turn to make sure we were still there – and when we weren’t he came running back after us to find us. If we had tried to train a dog to be as obedient we wouldn’t have managed it. As we got into the town I was getting more concerned about the dog getting run over, as although it was pretty traffic aware, there were odd occasions where it strayed into the road. Thankfully we found a vet and they took him in and said that they would place him in a kennels whilst looking for his owners. The poor thing was wet and hungry but as much as I love dogs …. we don’t need one in the motorhome at the moment! Relieved of responsibility, we took cover in the restaurant and filled our tummies on more lovely food – definitely worth a visit if you are in the area. After another ‘fresh’ run and beautiful sun rise we set off on our way to Pontevedra rather boringly to do some washing. It sounds daft, but we have been pleasantly surprised by the shiny new launderettes that Spain has – it is just unfortunate that they are only located in a few of the larger cities. Upon arriving at the rather sparse and ‘rugged’ Aire I confess to having been a little nervous about leaving the motorhome as it was basically a plot of land surrounded by derelict buildings, but it ended up being our home for two nights and apart from featuring as one of the top dog pooping spots, it was quite tranquil, not too far from the centre, and right next to the river. Despite agreeing to only stay one night, on Sunday we decided to walk inland along the river and we were pleasantly surprised by the beautiful forest filled with Eucalyptus trees and waterfalls, we walked about 9km inland before turning back – and it was well worth it… dare I say it, more attractive than the town itself, although the old town was full of beautiful old buildings and character. After changing our plans yet again we set off this morning to a Bodega (vineyard) on the Portuguese border just near La Guardia. The bodega is called Valminor Ebano and they mainly grow white grapes in this region, so we tried three of their best white wines in addition to a red – all of which were very nice. We bought 5 bottles of the red and one of the white to test my tolerance levels and headed to the car park for our ‘last supper’ (for a while anyway) in Spain which is where we are staying tonight. So finally tomorrow we will see what Portugal brings – neither Keith or I have ever been, so this will be a completely new experience for us.